Have you tried those frozen toaster strudels? Yeah not so good. I swear after I had one I started having heart palpitations, got really sleepy, groggy.... No joke. I think it was all the grease, oil or chemicals in there? My body just said no, not again and gave me a hefty warning. Sure it's better to make your own, puff pastry is all butter, which is better than chemicals and whatever else dangerous. (I love the crazy TV ad: a blond haired German kid: Hans Strudel wearing lederhosen popping out of nowhere in your kitchen, complete with morning birds, flying toaster strudel, angels singing, a baby deer --all to stare you down with odd smiles, while just hypnotizing you with these words: 'toaster strudel...ya?' Watch the baby deer in the window look on lovingly....who writes these ads? LOL). Wait is he supposed to be German or Swedish? He is wearing lederhosen and strudel originates from Germany or Austria. 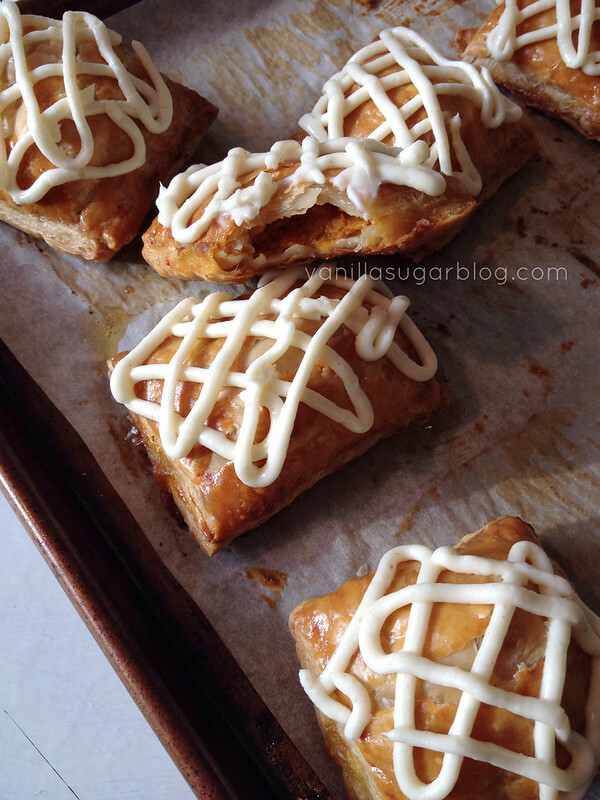 One of my baker friends made her own version of pumpkin strudel and I just had to do it as well. 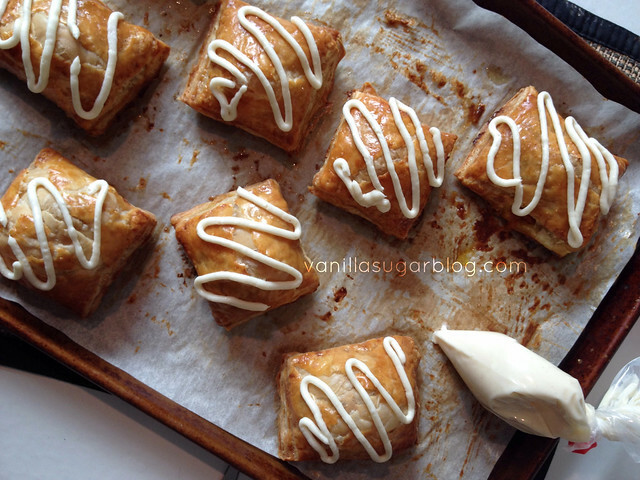 She, Amanda at I am Baker gives a a stellar recipe for homemade puff pastry you can make at home. 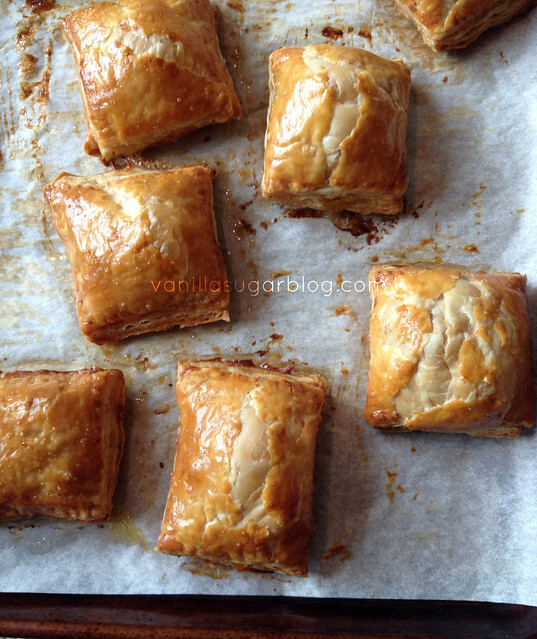 I was lazy strapped for time and used DuFour's Puff Pastry.Which is just as good as homemade. 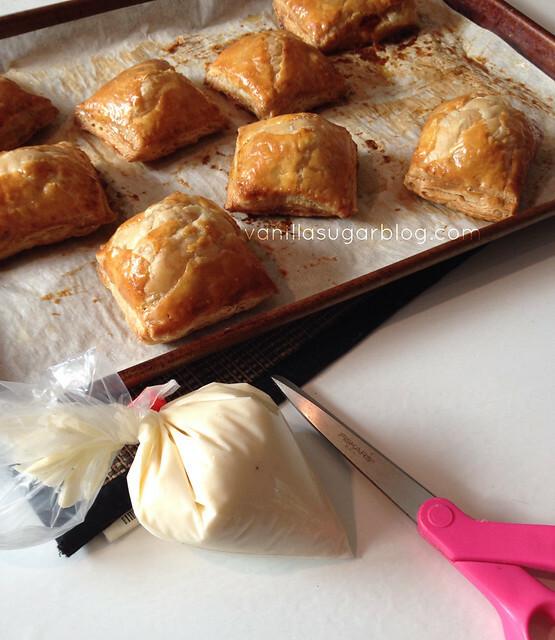 Really good puff pastry--so easy to work with. (just always keep it cold and it will return the favor of golden puffs of heaven). I really hate to part with them when they are so magnificent. Buuuuuuut I gave them away to a good, loving home that will cherish them. 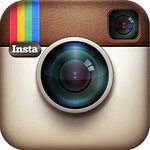 Did you see how easy that is? I bet you can do this too. Just keep the pastry dough cold at all times, don't over-fill with pumpkin, make sure to seal them well, and keep an eye on them baking (puff pastry loves to go from fabulous to burnt in minutes, so don't leave the oven after the 10-minute mark!). 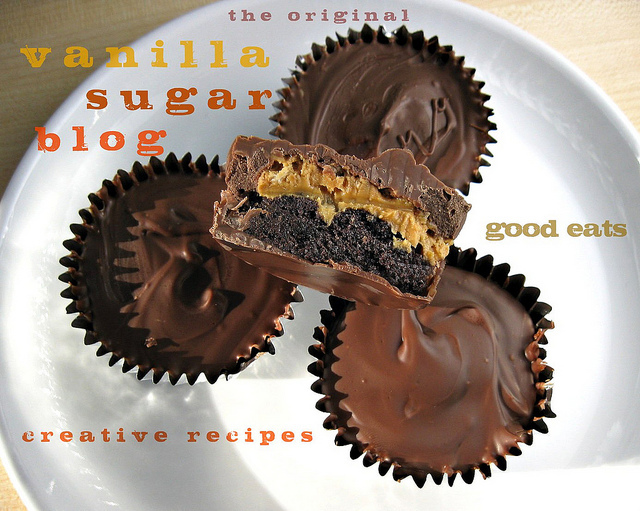 You can make these--I know you can. Imagine showing these beauties off to your friends & family during the upcoming holidays. 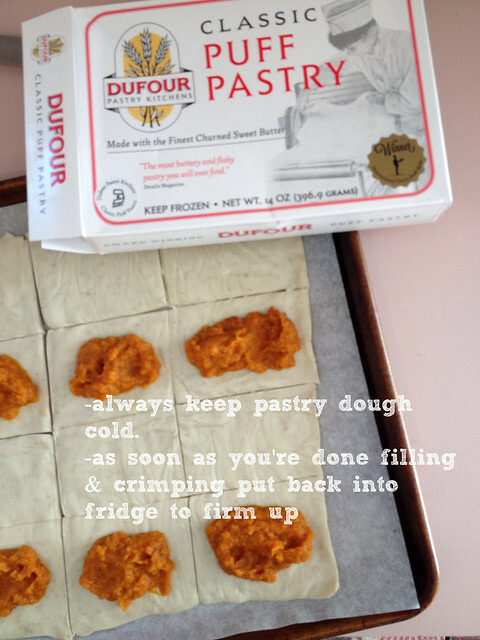 Always do your best to keep the puff pastry cold. After you're done filling and crimping the puff pastry, pop it back in the fridge for at least 15-20 minutes to let it firm up again. Puff pastry bakes best when it's very cold. I put corn syrup in the glaze as I wanted it to be glossy and harden up fast. You don't have to add it if you don't want too. For slicing out as perfect as can be squares in the puff pastry, use a sharp knife, use the original lines in the puff pastry as your first set of lines (one was down the middle horizontally and vertically) then looking at the pastry in horizontal form, cut two more lines on each side of the original middle line. Or you could just use a ruler as a guide to mark the lines. I managed to get eight good sized strudel pastries. mix the egg in a small bowl and set aside with a pastry brush at the ready. 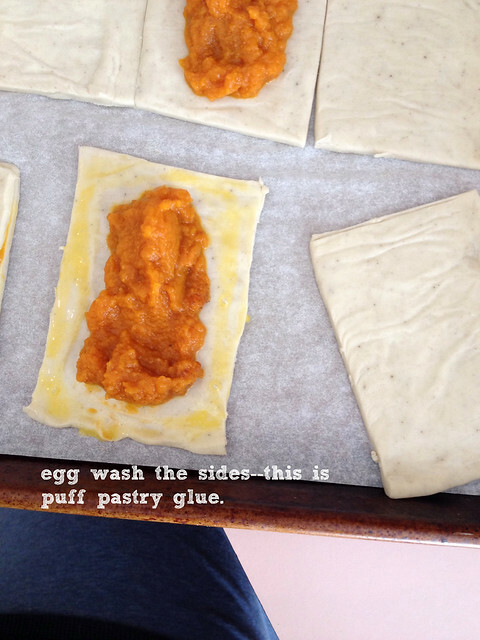 unroll the puff pastry, slice into squares, pop back into fridge while you get the pumpkin filling ready. 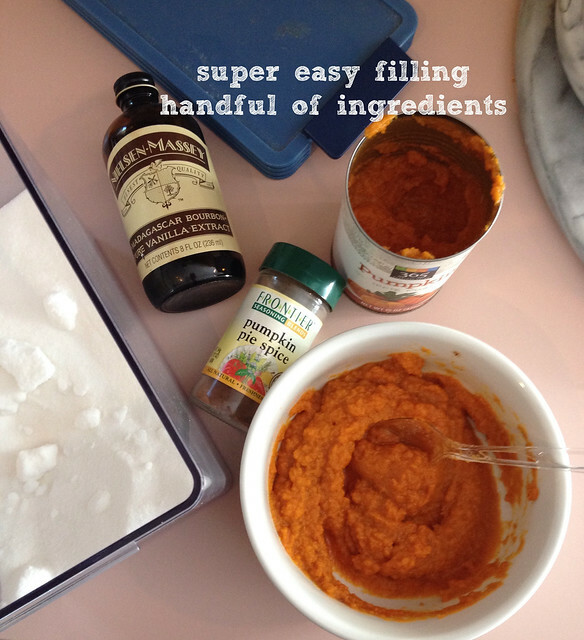 mix the pumpkin puree with all the ingredients. place a dollup (about a little more than a tablespoon) into half of the cut squares (the other half will be the tops). before placing the tops on the pumpkin filled squares, make sure to egg wash around the edges so the top half will seal nicely. when placing the tops on, make sure not to push down on the middle as the filling will move out. simply push down on the edges, and crimp them with a fork if you wish. since it's puff pastry you really won't see the crimping as the pastry bakes up, but the crimping will help to seal the edges nice and tight. 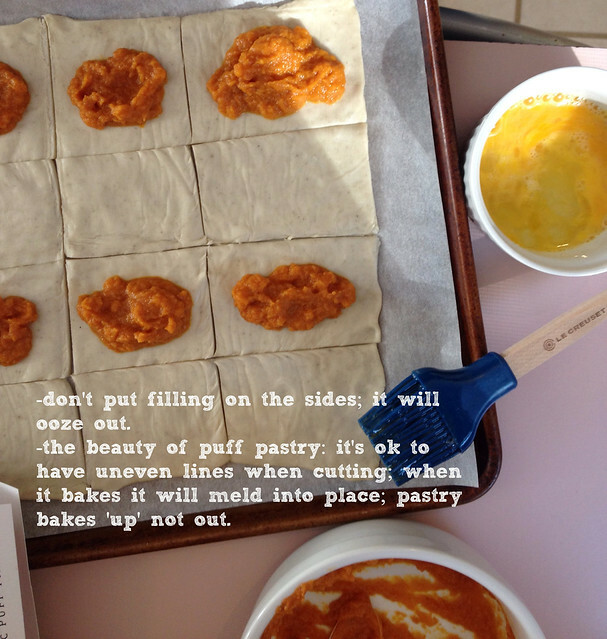 try not to poke any holes in the pastry while crimping as this might deflate the pastry while baking. place back in the fridge to firm up for at least 10 minutes before baking. 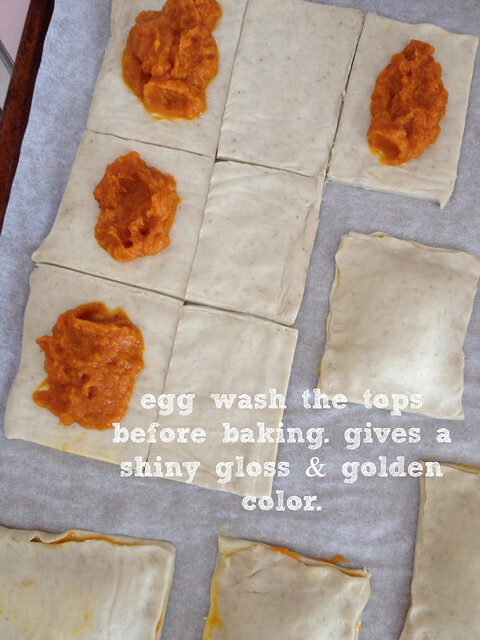 when ready to bake, egg wash the tops of the pastry. place in a 375 degree oven and bake for 15-20 minutes or until golden brown. let the strudel cool completely before glazing. 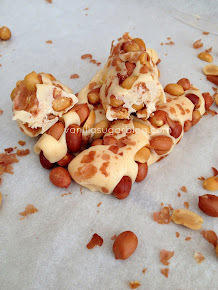 for an easy way to make the glaze and pipe at the same time, I put all the ingredients for the glaze in a ziplock bag and mixed well by kneading. you can only do this if your cream cheese is very soft/room temperature. 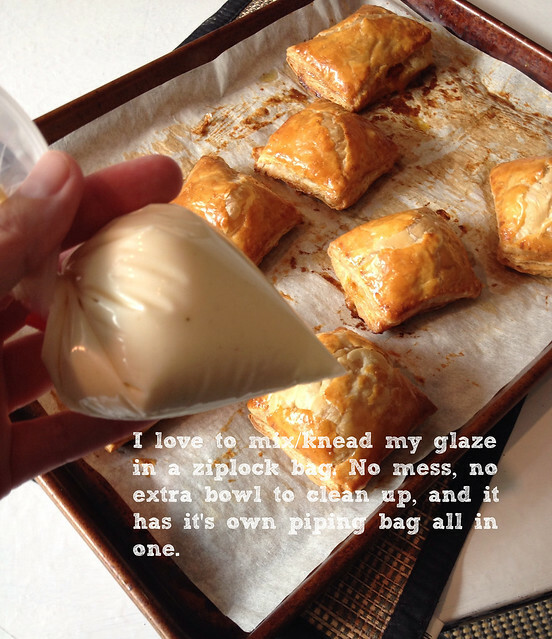 (or you can mix all ingredients with a hand mixer then place in a ziplock bag and pipe). snip the end off the ziplock bag and pipe one set of swirls one way, then repeat the other way or however you wish to do it. the ziplock bag as the mixing bowl/piping bag was such a timesaver. Love it! You gave such great tips and it looks SOOOOO good!!! You rock girl! thank you for the perfect inspiration! I like the idea of golden puffs of heaven stuffed with pumpkin and drizzled with cream cheese. 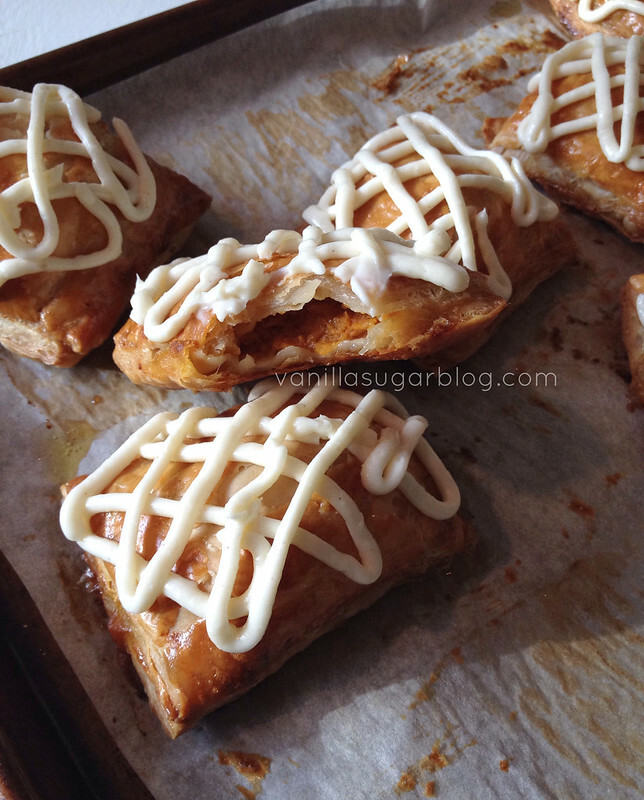 My kids and I made pumpkin butter pop tarts yesterday and they LOVED them! I have a feeling they would also really REALLY love these beauties. Way better than store bought! ooh these look awesome! must try them! I've actually never had toaster strudel, but I already know that I'd like yours better. Love that you pumpkin stuffed it! Okay, I don't think Toaster Streusel are that bad, but homemade is always better. These look fab! They are beautiful! I want to eat pumpkin everything right now. What a stellar way to start the day. Frozen toaster studels? No thanks. 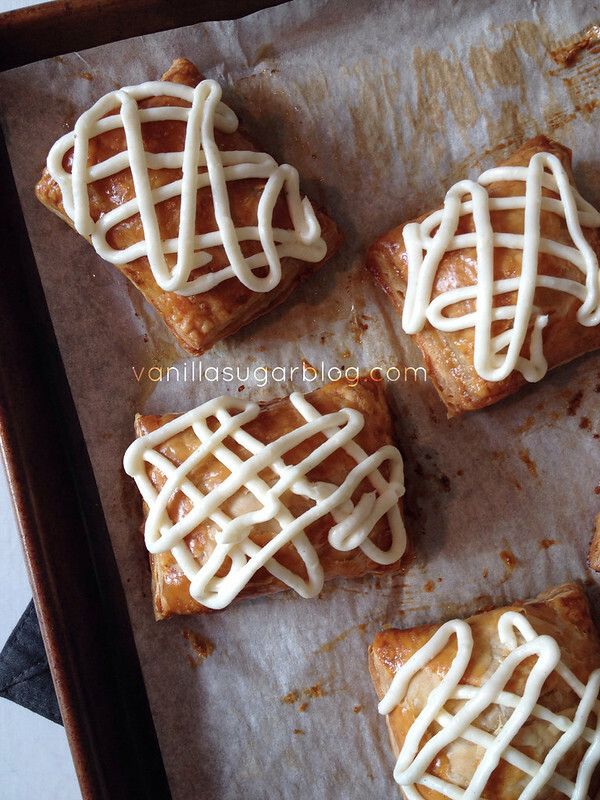 But a big yes to frozen puff pastry -- I love that stuff. And as you demonstrate, so easy to make your own strudels with it. Terrific flavor, great recipe -- thanks. great, great job! these look perfect, especially with that thick, fabulous glaze!